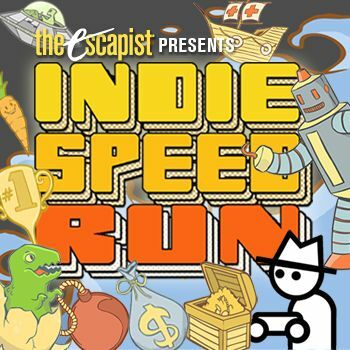 Indie Speed Run's second annual competition is officially live, and you can play all of this year's entries right here. Making a game is tough. Making a good game is even harder. Making a good game in the span of a weekend is borderline madness, but that didn't stop the contestants of this year's Indie Speed Run, a competition challenging developers to build a game from start to finish in 48 hours. The development period is now over, which means that all the entries are available to play for free right here at the Escapist. The Indie Speed Run challenges both pro developers and amateurs to try their hand at making a game. Each entry in the competition is the result of no more than four people, two days of development time, and probably an awful lot of caffeine. The finished products will be rated by sixteen judges including big names like Notch, Peter Molyneux, and Suda51, before being sent to Yahtzee for the final round of judging. But you can influence this too - the game with the highest rating from the community will also head straight to the final round. So, if you're up for some free indie games, look no further than the Indie Speed Run Free Play hub. There's a lot of good stuff in there, but if you don't have time to try it all, keep an eye out for each judge's choice as their picks are revealed in the coming weeks. Let the gaming begin!